This artwork originally appeared in the book “Clifford Takes a Trip” and has been circulating social media after Clifford creator Norman Bridwell died Dec. 12. I said farewell to a friend this week. I call him “friend” even though I never met him. But I knew him well by his words, by his art, by his imagination. And by his name, which was on the cover of many of my favorite books. Like me, many know him better as the man behind Clifford the Big Red Dog. Bridwell wrote and illustrated more than 40 Clifford books that sold more than 120 million copies worldwide. Clifford became an icon in other media as well, including cartoons, a feature film, a musical, stuffed animals, key chains, posters and stickers. I befriended Clifford at a young age. The school library was full of book-bound characters whom I learned to know and love: Clifford, Arthur, Amelia Bedelia, the Berenstain Bears. Of each series, I had my favorite. There was always that one book I would check out over and over again. With Clifford, it was “Clifford Takes a Trip,” its cover showing Clifford lying atop a city bus, much to passengers’ dismay. “Clifford Takes a Trip” also is the book that first featured an illustration of Clifford’s owner, Emily Elizabeth, sadly hugging him goodbye before the family left for a vacation. 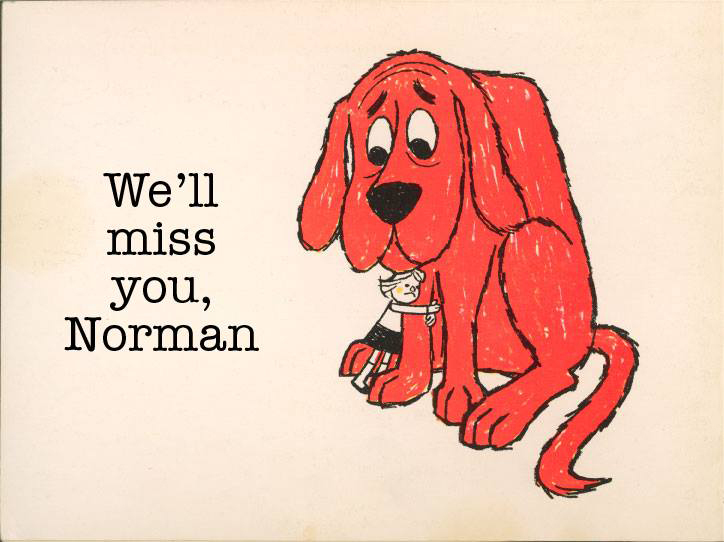 That same illustration has made its rounds on social media this week, stamped with the words, “We’ll miss you, Norman” and shared on the official Facebook page for Clifford the Big Red Dog. The page featuring that illustration broke my child heart with each reread. I was saddened every time. And I was saddened one more time when the illustration landed in my Facebook feed with the news of Bridwell’s death. Thank you for telling stories that teach us about friendship, compassion and kindness. Most of all, thank you for making my imagination as big as Clifford. This entry was posted in Reading, Unplugged imagination and tagged books, children, children's books, Clifford the Big Red Dog, Norman Bridwell. Bookmark the permalink. December 19, 2014 at 9:57 p.12. Thank you for this lovely post. I did not even know that he died! I will be missing (and I know the world will be missing) a great author/illustrator.